Mr. Francis & Mrs. Georgina Siakor - General Treasurer and Headmistress of CCIM Training Center. 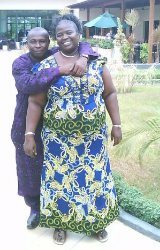 This husband and wife team came into Apostle Crossley's life on her first trip to Ghana. They have become her spiritual children. Francis is Keyboardist for Overcomers Faith Centre in Accra. He is the general treasurer on the International Board of CCIM. Georgina is the Headmistress of CCIM Training Center. The school that is being built in Asesewa, Ghana. She has graduated and done her apprenticeship from a school of Tailoring and Design. Georgina will be in charge of the sewing school in Asesewa. She and Francis have been married since June of 2000. Together they will run the school for Apostle Crossley. Francis is also Site director. He will oversee the construction of the facilities in Asesewa. Mrs. Stacy L. Anaman - Missionary of The Church On The Way Praise Center and ordained to go into all the world and minister the gospel of Jesus Christ. Stacy’s heart is missions. When the call came to go to Africa she was the first to volunteer. Her first trip into Africa was November 2000 and since that time she has gone every year except in 2004 when the trip was canceled. Stacy has a heart for the people and communicates well with them even tho she only speaks English. 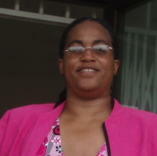 Stacy travels with Apostle Crossley as companion and works as liaison with the team members. She is the front runner and will dare to go where others will have to go later. A grandmother and entrepreneur. She willingly and faithfully goes into the schools to minister to the children with great encouragement. Hornam and NAA with baby daughter - - -Accra, Advisor/Executive Board and General Secretary of CCIM. This young couple also came into Apostle Crossley’s life on the first trip to Africa. He has served as Worship Leader in Overcomers Faith Centre church. Raymond has been furthering his studies in Sacred Music in the USA for several years. Recently married to Klorkor who serves as General Secretary for CCIM. Horman and NAA has been such a tremendous blessing and inspiration to CCIM. She just knows how to put together what is needed to satisfy the legal system, having served in that capacity in Accra for quite a time. 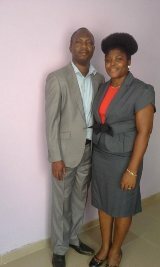 Pastor Stephen Awotwe and his wife Lily are from Accra, Ghana. Pastor Stephen is a husband and father of four children. He is Senior pastor of Liberty Victory church in Ashamian Ghana, West Africa. Pastor Stephen is a teaching machine wrapped in a small package. He is Field Director for CCIM and is also part of the teaching team. Pastor Stephen has worked with Apostle for over four years and done a superb job. He along with Missionary Stacy will get what ever job Apostle Crossley needs, done. His wife Lily has an active role in the ministry. If there is interpretation to be done Pastor Stephen can handle it. He has gone ahead of Apostle Crossley to scout out the land on many occasions. Pastor Stephen has worked with Morris Cerullo's ministry in Ghana and does interpreting for various ministers from the USA.